Not every hostess knows what they hide behind themselvesConventions - icons that are present on the labels of clothing. Many prefer to ignore them. And very vain. After all, indications for washing and ironing of flax, cotton, silk or fabrics containing synthetic fibers can be very different. After all, no one wants to ruin a thing through ignorance? Put a new and expensive dress in a washing machine, and get out clothes for a five-year-old girl? Or find out that a bright red T-shirt for 99 rubles has become pale pink, shedding on things that cost ten to twenty times more expensive? What can I say about melted blouses, burnt holes and so on. So let's slowly find out what icon icons mean on clothes to extend the life of your favorite things. What do conditional badges mean on our clothes? 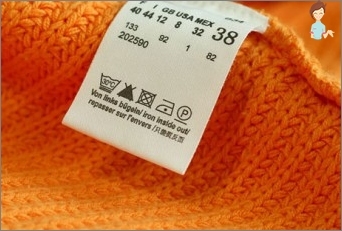 The marking indicating the temperature and conditionsWashing even with the same fabric composition, can things of different brands vary significantly. 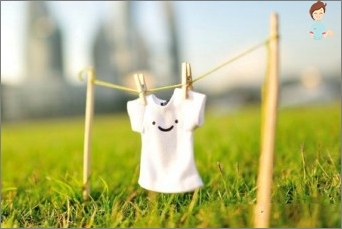 Therefore, even if you are sure that a thing can safely withstand washing at a temperature of 60 °, and on the label is 30 °, then you should follow the manufacturer's recommendations. After all, he is aware of the properties of the fabric and the paint in which it is colored a bit more than us. Whatever it was, but the recommendations areRight in the icon on the labels, each of which indicates what it refers to. If they relate to washing, then on the icon there is a bath, ironing is indicated by the image of the iron, the procedure of bleaching is by a triangle, drying is hidden behind the square, and dry cleaning is indicated by a circle. If the image is crossed out with two lines, then it is forbidden to apply to this thing. One line indicates that a gentle mode is required. Delicate care is marked by a double line. The degree of washing is inscribed right into the pictogram. To exceed it is not recommended, in order to avoid damage to clothing. The highest degree is 95 °, it indicates that washing with boiling at 95 ° C is allowed for this product. This temperature is recommended for things made of cotton flax and white. But some manufacturers seem to be trying to confuse us even more, and instead of numbers, they enter the points. One point corresponds to a temperature regime of 30 °, it is set for woolen things. This is what concerns machine washing. If the product is only for hand washing, then on the label you will find a picture of the hand. 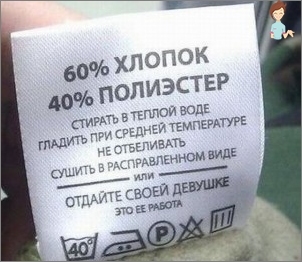 The value of the icon "Crossed out hand»- this product can not be washed. It is intended for dry or dry cleaning. The notation for drying things applies the same principle as for washing, only the base of the pictogram is the square. It indicates that drying is allowed. If the square is crossed out, it follows thatThing in the washing machine is not recommended. A circle inscribed in a square means that apart from drying in the machine, squeezing is allowed. If the pictogram is crossed out, it means that you can not dry or squeeze these clothes in the typewriter. If in the circle shown in the square,The points are added, they mean the recommended temperature. One point - drying is allowed at minimum temperatures. Two points - drying at medium temperature is allowed, three at high temperature. As already mentioned, ironing is indicated by the icon of the iron. Iron, enclosed in a circle - recommends whenUse the temperature up to 140 °. An iron with one dot means that for this product a temperature of 100 ° is allowed, it is used for articles made of synthetic materials. In this case, if you iron a product consisting of 100% wool, then it is necessary to put gauze moistened with water under the iron. Two points - 150 °, three - 200 °. The latter is used for ironing linen andCotton products, which are recommended for moistening. Some products, for example, sewed from suede or corduroy, are not allowed to steam, this is indicated by the ironing icon with the crossed under the ferry. Dry cleaning, which is represented by an iconCircle, is not allowed for all things. Just like bleaching, which is marked with a triangle. If a circle or triangle is crossed out, it means that these actions for the product are prohibited. An empty circle allows dry cleaning only with dry substances, which can be done only in dry-cleaning conditions. A circle with the capital "A»Allows dry cleaning with any reagent. It is recommended that you act very carefully. And the capital letter "R"Means that it is allowed to use standard cleaners - chloroethylene, monofluorotrichloromethane or hydrocarbon. A circle with the symbol F recommends dry cleaning or washing only with white spirit. Surely in every house there are soda and lemons, from which you can squeeze lemon juice. With the help of these tools, you can save white things from the effect of yellowness. They are used for manual washing. Nothing complicated, right? Use our recommendations, remember what the badges for caring for your clothes mean, and you will never have any more disappointment from a spoiled washing machine, a dry cleaner or an iron of things!